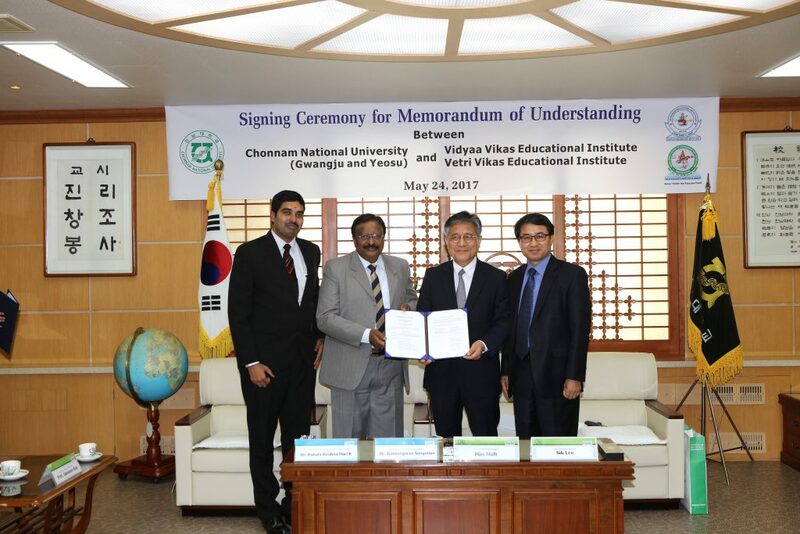 Association of Scientists, Developers and Faculties an International Organization acting as the catalyst for exchanging MoU between Universities has recently engaged in a Memorandum of Understanding between Chonnam National University and Educational Institutes in Trhichengode, India viz Vidyaa Vikas Educational Institute and Vetri Vikas Educational Institutes this May 24, 2017. This MoU has been inked as per the direction and mutual agreement between Chonnam National University President Jeong Byeong-suk and Verti Vikas Founder Dr. Gunasegaran Sengodan. The two sides agreed on mutual cooperation plans such as the entrance of Chonnam University, exchange of teachers, joint degree, and joint research in the agreement. Meanwhile, Chonnam University was selected as a consortium of four universities (Jeonnam University, Mokpo University, Sunchon University, Chodang University) in the region by the Ministry of Education’s Ministry of Education in 2014 to carry out various projects to strengthen global competitiveness such as diversification of foreign students is. As a result, Chonnam National University’s foreign students increased by 33.8% from 325 in 2014 to 435 in 2016, while the proportion of Chinese students from 91.1% to 53.9% has diversified. The ASDF Secretary General Kokula Krishna Hari K witnessed the MoU inking ceremony and addressed the gathering.